LaGuardia Airport, the smallest of the New York Metropolitan area's three primary commercial airports, is the closest to Manhattan, and its location is envious. On the waterfront of Flushing Bay and Bowery Bay, it borders the neighborhoods of Astoria, Jackson Heights and East Elmhurst, and boasts a stunning view of the Big Apple. But its on-time performance and appearance is abysmal, and it is the lowest-rated airport in the United States. In 1960, LaGuardia Airport was voted the "greatest airport in the world" by the worldwide aviation community. In 2010, Zagat's annual air travel survey of 8,000 travelers gave it a rating of 6.18 out of 30, which means LaGuardia is, for the fourth time in a row, the lowest-rated airport in the U.S. (LaGuardia's sister airports didn't fare much better. John F. Kennedy and Newark Liberty ranked only a few spots higher on the list. Portland International Airport took top honors.) LaGuardia also ranked last out of 66 airports in the United States in a passenger satisfaction survey compiled by J.D. Power and Associates. Part of the problem is that LaGuardia was expanded over the years in a piecemeal fashion, making it one of the ugliest and inefficient airports in the world. 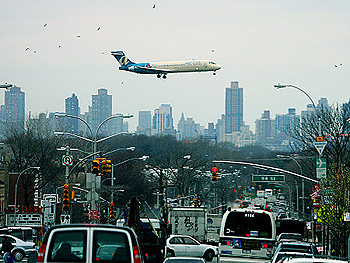 But the biggest problem for LaGuardia is that it has only two runways. LaGuardia opened in 1939 with four runways at 45-degree angles to each other. Capacity is significantly reduced when runways intersect, thus, the trend for the largest airports is to have parallel runways permitting simultaneous takeoffs and landings. Parallel runway configurations generally demand more space than crossing runways, which LaGuardia did not have. For the most part, LaGuardia uses one runway for arrivals and the other runway for departures—which makes sense unless meteorological conditions ensue, causing them to use one runway. That's right; only one runaway for takeoff and landings at one of the busiest airports in the world. The Port Authority of New York and New Jersey, which operates LaGuardia, estimates that the airport handles approximately 50 percent of all regional airliner traffic. In April 2010, the Port Authority of New York and New Jersey hired consultants to explore a full demolition and rebuilding of LaGuardia. The project would create a unified, modern and efficient plan for the airport, currently an amalgam of decades of additions and modifications. The rebuilding would be staged in phases in order to maintain operations throughout the project. According to the U.S. Department of Transportation, although new technology and procedures can enhance airport capacity, new runways typically bring the greatest increase. Yet, the last new runway added at any of the New York major airports occurred at Newark in the early 1970s, and there are no plans to add any new ones. For example, an August 2007 Port Authority of New York and New Jersey study determined it was not feasible to construct new runways. The study concluded that any new runway project would not only be very costly and controversial but also extremely difficult to advance as it would be built within a protected environmental area. In contrast, 17 other major airports across the nation have added new runways since 1999. These include busy airports such as Chicago O'Hare, Atlanta Hartsfield, Boston Logan and Washington Dulles. Over the last decade, flight demand in the New York region has grown considerably. Between 1999 and 2008, the number of flights departing the New York area increased by 8 percent (from 567,000 to 612,000)—the equivalent of adding a mid-sized airport's flight operations (e.g., Albuquerque or New Orleans) without building a single new runway. While the existing New York airspace may be used more efficiently in the future due to FAA's ongoing airspace redesign, the Agency states that this project will not increase airport capacity. In 2008, LaGuardia handled 23.1 million passengers; JFK handled 47.8 million and Newark handled slightly more than 35.4 million, making for a total of approximately 106 million travelers using New York airports. This figure represents the largest airport system in the United States, and largest in the world in terms of flight operations, and second in the world (after London) in terms of passenger traffic. So it should come as no surprise that 26 percent of incoming flights at LaGuardia and JFK arrived late or were canceled in 2010; at Newark it's 28 percent. The delays cost the U.S. economy billions, and caused a ripple effect that snarled air traffic nationwide. Nearly two-thirds of flight delays at the three New York airports are attributable to weather and high volume (congestion)—twice that of the other 52 largest airports that FAA tracks. Winds are the primary determinant of the number of runways available for simultaneous use. Aircraft can use a runway for takeoff or landing only when the crosswinds are within prescribed limits and tailwinds do not exceed 5 to 6 knots (9-11 km/h). Being delayed is no doubt infuriating. But next time you want to swear off LaGuardia (or JFK and/or Newark for that matter), remember that Kennedy, LaGuardia and Newark airports are compressed into less than 100 square miles—making New York's airspace one of the densest in the country. Or, you can always take a bus or train.